Students at Ecker Hill Middle School participate in an escape room activity. 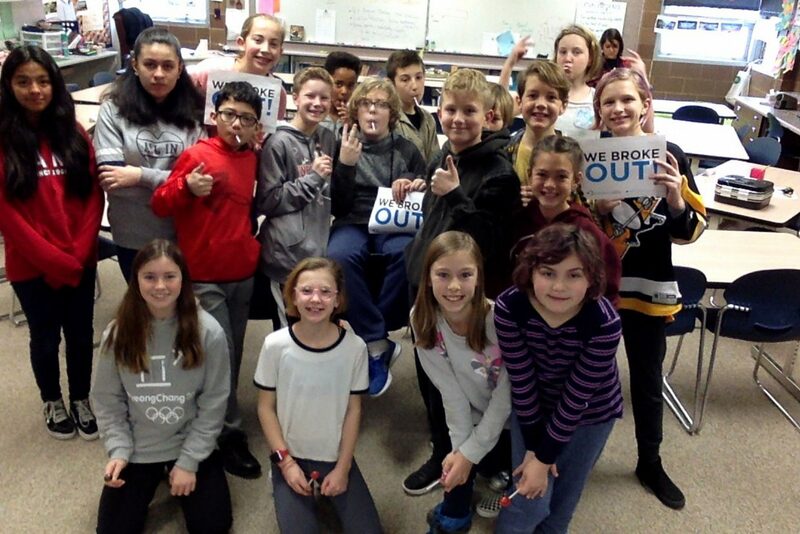 Andrea Solum, a teacher at the middle school, received a teacher grant to purchase pre-made escape room kits for her own classroom. She had just witnessed a full class of students be entirely engaged by a science lesson taught under the guise of an escape room. Students had to use what they learned in previous science lessons to solve clues and “escape” the classroom. “I left there and I could not stop talking about how cool it was,” she said. So she went home that night and wrote a grant proposal to the Park City Education Fund for $250 so she could implement a similar lesson plan in her permanent classroom. Solum, a language arts teacher at Ecker Hill Middle School, was one of the recipients of the foundation’s teacher grants. The education foundation recently awarded $75,000 in teacher grants to instructors and administrators throughout Park City School District. The foundation provides grants to teachers for materials, curriculum or programs that are meant to improve the education experience for their students. Solum will use the $250 she received to purchase pre-made escape room kits that teach reading and writing skills. She has received several grants in the past for her classroom. She said the funds provide teachers the chance to experiment with new teaching methods or lessons. Some of the programs funded by teacher grants in the past have become so successful that they have been adopted at other schools or by the district as a whole. A teacher at Trailside Elementary School received a teacher grant a few years ago to start a coffee cart so special education students could serve coffee to teachers and administrators at the school. Coffee carts are now at almost all schools in the district, and a teacher at Jeremy Ranch Elementary School received a $1,000 teacher grant to implement a similar program at her school this year. Samantha Highfield, co-chair of the education foundation’s teacher grant selection committee, said piloting programs in a classroom is one of the benefits of teacher grants. But, most of all, she likes that teachers get a chance to be creative. “Our teachers are the ones who are there in the classroom with our kids, and if they have an idea of ‘this program might work,’ let’s jump on board and let’s support them with that,” she said. This year, like most years, there were trends that emerged in the teacher grant proposals, Highfield said. Trends included grants for capital expenditures — like $15,000 to create a flexible learning space in Treasure Mountain Junior High’s library — and for special education programs. Several teachers asked for materials for dual-language immersion learning, such as a new program at Ecker Hill Middle School called Hablemos! Spanish teacher Patricia Munoz received a $7,500 grant to create an organization that will allow students to practice their Spanish language skills while participating in cultural activities like cooking, crafts, theater and dance. Participants in the program are expected to meet once a week after school. Kassie Deckard, who manages the makerspace at Parley’s Park Elementary School, received a $5,500 grant to roll out the Global Inventors program at the school. The program uses curriculum from the national education organization Level Up Village to connect students in Park City with those in different countries. Students at Parley’s Park will have pen pals from a Spanish-speaking country and will work together on a project to design and create 3-D solar-powered flashlights. Deckard will then help the Park City students print the flashlights with the school’s 3-D printer. Throughout the eight-week program, students will be able to work on communication and Spanish language skills and learn about different cultures, she said. She was shocked to receive the grant, because this is her first year in the district. She said receiving the grant took away the worry of figuring out how to bring the program to the school. Stephanie Lassig, a special education teacher at Jeremy Ranch Elementary School, had a similar reaction. She said she got a little emotional when she learned she would be given $2,413 to purchase C-Pens for her students. The pens help students with reading disabilities learn to read, because they contain small scanners that read the text and vocalize it to the students through an ear bud. Lassig purchased a C-Pen for her son and was amazed to see how much it helped him be more independent in school. She wanted to purchase one for all her students, but at $275 a piece, that was not an option.